I help my clients to enjoy the full benefits of the underlying graph that links the objects described in their data. 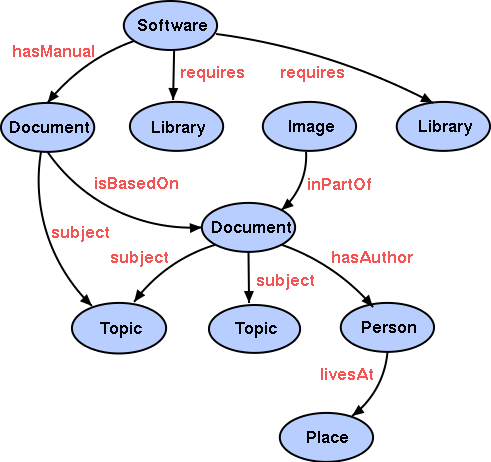 This graph may link documents to their authors, events to places, products to their documentation, despite of these objects being stored in distinct databases. The traditional data storage technologies that use tables (relational databases, SQL) or trees (NoSQL, JSON, XML), force the data modellers to make compromises with the original mental data model. Today, standard technologies enable the storage of native graphs, so that you don’t need to make any compromise with your data model. This set of standards and methods to publish data is called Linked Data, because it establishes explicit links between objects (documents, people, places, etc.) This consequently is a solution to data silos (thanks to the native links) and closed platforms (thanks to standards). If you would like to assess how Linked Data could benefit to your organization, contact me! I’m especially interested in Open data projects. Excellent book for those who want to learn how to create ontologies and data modelling in the Semantic Web. You just need to have read the first 3 items of my list to be at ease reading this book. The book of the Linked Data practitioner. It covers dozens of typical use cases.